You have been holding out on us! I am kept from building SIBs by the unavoidable nature of the process! I have very little patience, and spending hours fiddling about through the neck of a bottle would not give me any pleasure at all - more like frustration. Wire rigging cannot be made fold down and up again without looking awful, and I doubt if I could ever get a sea into a bottle in a satisfactory manner. Rigging a SIB by conventional means seems to require the masts and spars to be too thick for my liking, probably as they have to have holes drilled through them, and need the added strength. I have made two or three SIB in years gone by, but on each occasion, I cut the bottoms off the bottles, and put them back after the ship was in, disguising the join with fancy ropework. But another annoying thing was the distortion caused by the glass (I used gin bottles). I know you can get really perfect bottles if you pay for them, or use light bulbs, or even old radio valves. But I just prefer the easier option of making them in display cases. But that does not stop me appreciating what ship bottlers achieve. For some time, I have been wondering where Dave Fellingham has gone - as his SIB was most impressive. A major problem with me would be the apparent time required - my patience wears thin very quickly! For several years, I admire by your models, which you show us! It's really amazing quality of work and your skills! Rigging a SIB by conventional means seems to require the masts and spars to be too thick for my liking, probably as they have to have holes drilled through them, and need the added strength. For some time, I have been wondering where Dave Fellingham has gone - as his SIB was most impressive. What diameter usually have the masts and yards of your models? But another annoying thing was the distortion caused by the glass (I used gin bottles). I have not seen Dave on FB in long time. Do you not know - he's all right? The masts and spars vary in thickness depending on the model, but as they are made of metal, I can make then a lot thinner than wooden ones. Real sailing ships would not even stand up if their masts were too thick. A mast with a diameter of 2 feet at the deck level would only be 1/16th of an inch in a 32 feet to 1 inch scale model (1:384). I have no idea where Dave is. 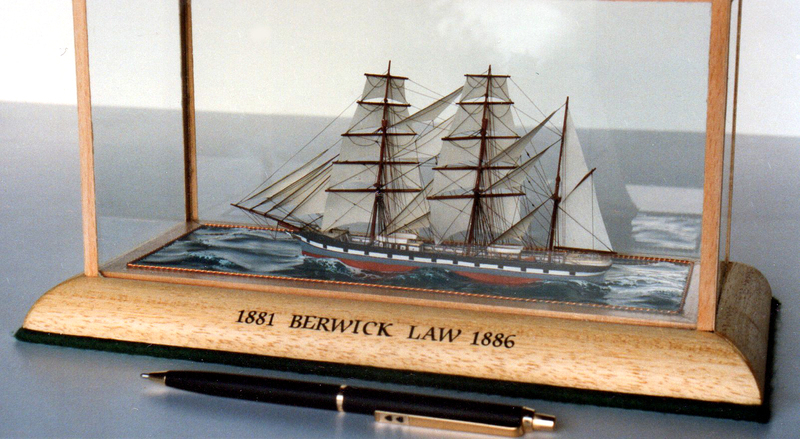 Here is a very small model of the Berwick Law under full sail. This was built to the much smaller scale of 50 feet to 1 inch and only took about 24 hours to build, spread over a few days. I didn't bother with ratlines at all, but it is not really noticeable. The upper spars are a bit too thick, but an attractive model nevertheless! I know a lot of you work to much smaller scales than this, but 50 feet to 1 inch (1:600) is about my limit for miniatures. I have tried smaller scales, but without much success! Wow!!!!!!!!! I really like this one Bob! Lovely work. Looks very much like the"Polly Woodside" in Melbourne Australia. Yes, Very much like Polly Woodside, but a lot larger, with same general design and rig. Great work on both models.